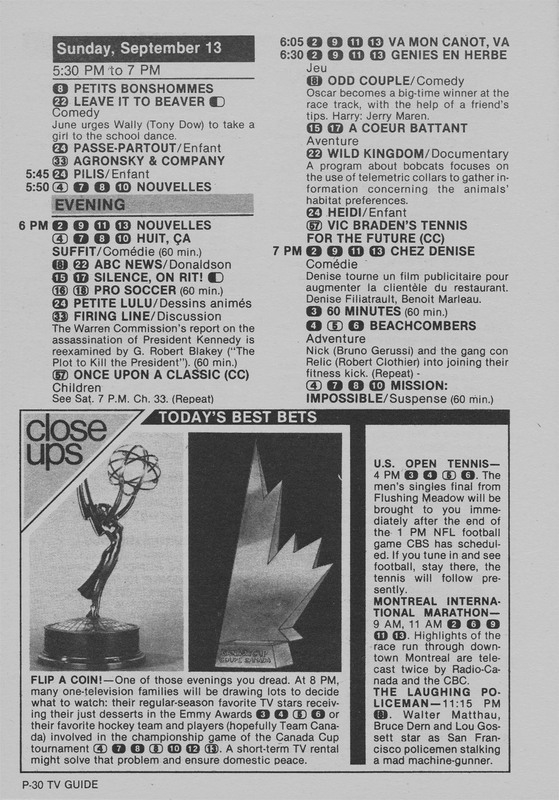 When Telemedia took over TV Guide Canada in 1977; there was initially 8 editions of TV Guide which included; Western British Columbia Edition, Eastern British Columbia Edition*, Alberta Edition, Manitoba-Saskatchewan Edition, Western Ontario Edition, Toronto-Lake Ontario Edition, Montreal-St Lawrence Edition and Maritime Edition. By 1988 there were 16 editions which included; Western British Columbia Edition, Alberta Edition, Saskatchewan Edition, Manitoba Edition, North Shore Edition, Sudbury Edition, Western Ontario Edition, Hamilton & Region Edition, Toronto Edition, Oshawa-Peterborough Edition, Ottawa-Eastern Ontario Edition, Montreal Edition and Maritime Edition. Published starting in 1954 and contained listings for Vancouver and Victoria TV stations. This edition was not typically sold on newstands in Canada however it could be received by subscription. This edition was replaced by Puget Sound Edition starting in 1962 for the communities of Vancouver, VIctoria and Bellingham. The Seattle/Tacoma area began receiving their own edition at the same time. Western Washington Edition would eventually return in 1972 for US viewers only. Pubished from 1962-1972. This edition served both US and Canadian viewers from 1962 until the November 27, 1965 issue. Starting with the December 4, 1965 issue, viewers in Canada began being served by Western British Columbia Edition. The Puget Sound Edition continued to be sold on US newstands until 1972 when Western Washington State replaced this edition along with Seattle-Tacoma Edition. Published as early as 1993. 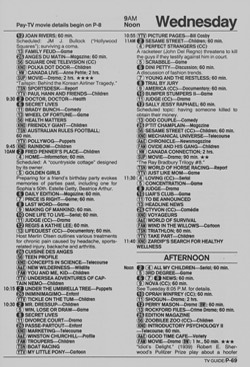 This edition featured cable compatable listings for Rogers Cable in Vancouver. This edition was replaced by the Vancouver Shaw Cable Edition in 2001 when Shaw Cable took over Rogers Cable in Western Canada. Published from 2001-2004. This edition replaced the Vancouver Rogers Cable Edition when Shaw Cable took over Rogers Cable in Western Canada. This edition was replaced by the Vancouver Shaw + BC Edition in 2005. Published from mid-2005 until October 30, 2005. This edition replaced the Vancouver Shaw cable edition and BC Edition. This edition's channel bullets corresponded to Shaw Vancouver dial positions. This edition was replaced by Western Canada Edition starting with the November 6, 2005 issue. Published from as early as 1981. It is not known when this edition of TV Guide was discontinued. Cities such as Kelowna and Kamloops were eventually listed in the BC Edition of TV Guide beginning in 1997. Published by the American version of TV Guide as early as 1962. This edition was sold in both the US and Canada. This edition mostly featured listings for Alberta stations and the two stations in Great Falls, Montana. This edition was split into separate editions starting with the December 4, 1965 issue of TV Guide. Canadian viewers were served by Alberta-Eastern British Columbia Edition while Montana would receive its own edition. Published by the American version of TV Guide starting December 4, 1965. It is not known if this edition was published by the Canadian version of TV Guide beginning in 1977 or if it was split into two separate editions or simply just became Alberta Edition. It is unclear if there was an early version of this edition from the 1970s. The later version of this edition ran from 1986 until 1998 when Calgary Shaw-Southern Alberta* and Edmonton Cable-Northern Alberta* replaced this edition along with Calgary-Edmonton Cable Edition. Published as early as 1978. This edition was replaced by Alberta Edition in the fall of 1986. This edition should not be confused with the later edition Shaw Calgary-Southern Alberta Edition. This edition likely started in 1988 and featured listings specific for the two cable companies serving the city at the time. The locals featured cable dial specific numeric bullets rather than the traditional over-the-air numeric bullets. The specialty channels were identified by 2-3 character bullets (Same as other issues at the time). This edition replaced the calgary cable edition at least by 1993 (though it may have been as early as 1991 or 1992). This edition featured cable compatible bullets for the two cable systems that served Calgary at the time. Initially the black numeric bullets identified dial positions for Rogers Cable and white numeric bullets identified dial positions for Calgary Cable/Shaw Cable. The two systems were harmonized sometime in 1995 when Shaw Cable took over the Rogers system. At that time the dial positions for the harmonized Shaw Cable system were identified with just black numeric bullets. Once the two systems were harmonized, the edition became known as Calgary Shaw Cable Edition. This edition was replaced by Calgary-Edmonton Cable Edition in August 1997. This was a short lived edition that combined the Edmonton Cable Edition and Calgary (Shaw) Cable Edition starting with the August 30, 1997 issue. Edmonton Videotron dial positions were identified with black numeric bullets, Edmonton Shaw Cable dial positions were identified with white numeric bullets and Calgary Shaw Cable dial positions were identified with a wider bullet with bolded borders on the left and right. This edition ran until the February 28, 1998 issue when it was replaced by Calgary Shaw-Southern Alberta Edition* and Edmonton Cable-Northern Alberta Edition*. This edition replaced the Calgary-Edmonton Cable Edition and Alberta Edition for Calgary and Southern Alberta communities starting with the March 7, 1998 issue. This edition featured cable compatible listings for Shaw Cable in Calgary. This edition was also known as Calgary & Area Edition and simply just Calgary Edition during the span of its existence. This edition was replaced by Prairie Edition by mid-2005. Published as early as 1978. This edition was replaced by Alberta Edition in the fall of 1986. This edition should not be confused with the later edition Shaw Edmonton-Northern Alberta Edition. This edition began as early as 1993 (though it may have started as early as 1991 or 1992). 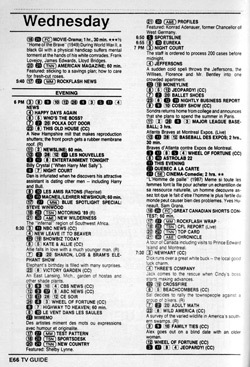 This edition featured cable compatible listings for both cable systems that served Edmonton at the time. Videotron dial positions were identified with black numeric bullets while Shaw Cable dial positions were identified with white numeric bullets. This edition was replaced by Calgary-Edmonton Cable Edition starting with the August 30, 1997 issue. This edition replaced the Calgary-Edmonton Cable Edition and Alberta Edition for Edmonton and communities in Northern Alberta starting with the March 7, 1998 issue. 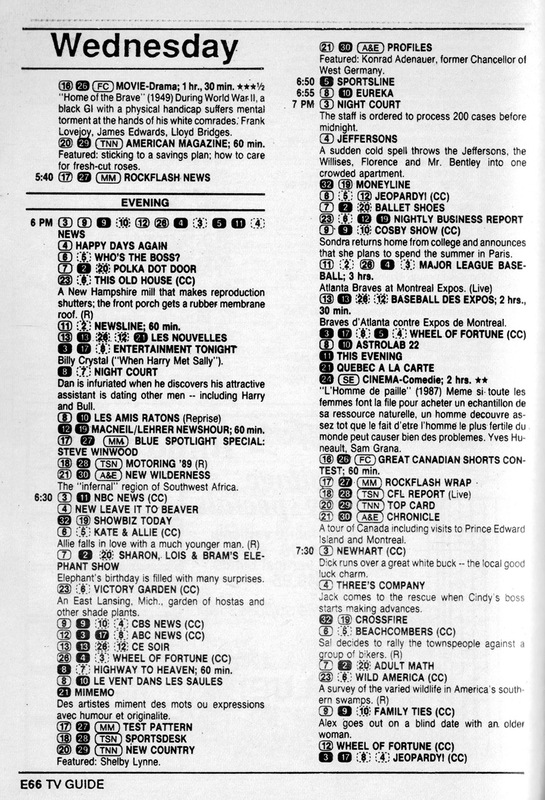 This edition featured cable compatible listings for both cable systems that served Edmonton at the time. Videotron (Later Videon) dial positions were identified with black numeric bullets and Shaw Cable dial positions were identified with white numeric bullets. When Shaw Cable took over Videon Cable this edition began to identify the different dial positions as East and West with the west (Former Videon Cable) continuing to be identified with black numeric bullets and the east being identified with white numeric bullets. The edition on the front covers was initially Edmonton Videotron/Shaw-Northern Alberta Edition, followed by Edmonton Videon/Shaw-Northern Alberta Edition and finally Edmonton Shaw-Northern Alberta Edition. This edition was also identified as Edmonton & Area Edition and simply just Edmonton Edition throughout its existence. This edition was replaced by Prairie Edition starting in mid-2005. This edition replaced the Manitoba-Saskatchewan Edition starting with the February 9, 1980 issue for viewers in Saskatchewan. During the early years of this edition, U.S. locals were from Williston, Minot and Grand Forks from North Dakota. By 1986, most cable systems in Saskatchewan were making use of CANCOM's Detroit feeds and thus Detroit listings replaced the locals from North Dakota at that time. In later years of this edition, some of the Minneapolis locals (WCCO and KARE) began to be listed in this edition. This edition was replaced by Prarie Edition starting in mid-2005. Published from February 18, 1961 to November 27, 1965. This edition featured listings for North Dakota, South Dakota and the Winnipeg market. This edition was the third edition to serve Canadian viewers. Published from 1977-1980 This edition was published by the American publication of TV Guide prior to 1977 since December 4 1965. With the exception of KCND in Pembina, ND; this edition only featured Canadian channels in the listings for the first 5 years. 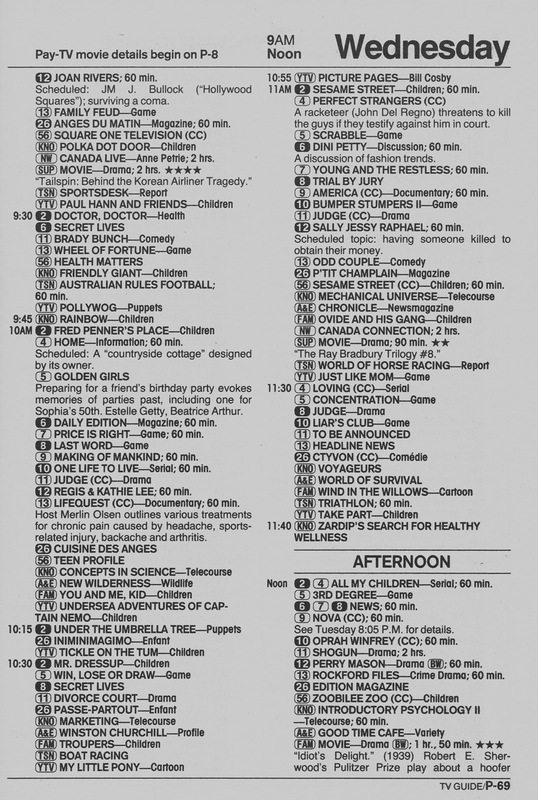 Despite the fact that cable TV brought distant US signals from North Dakota to Winnipeg starting in August 1968, program listings did not include listings for distant North Dakota locals until the August 15, 1970 issue. Starting with the February 9, 1980 issue of TV Guide this edition was split into Manitoba Edition and Saskatchewan Edition. Published from 1980-2005. During the early years of pay-tv in Canada, this edition lacked listings for specialty channels like Much Music, TSN, A&E, CNN and TNN. This was due to both Winnipeg area cable systems were unable to carry more than one pay-tv channel due to technical limitations and a dispute with MTS over usage of the street polls. TSN and MuchMusic would be added by the fall of 1985 with other specialty channels such as A&E, CNN and TNN by the late 1980s. Starting in the fall of 1986 this edition began listing some of CANCOM's Detroit feeds as many cable systems in Manitoba began carrying these feeds in place of unreliable distant locals from North Dakota. Listings for the Minot locals were dropped prior to CANCOM listings being added. The Fargo listings (except for PBS) were dropped when CANCOM listings were added. By the late 1990s, this edition also started listing some of the Minneapolis locals (Mainly WCCO and KARE). This edition was replaced by Prairie edition starting in mid-2005. This edition likely started in the early 1990s. It is unclear if this edition replaced the North Shore Edition for viewers in Sault Ste. Marie. It is also unclear if this edition may have replaced other regional editions in the area specifically for North Bay and Timmins. This edition appeared to serve viewers in Northern Ontario. This edition is one of the most unique editions of TV Guide. Rather than using the traditional numerical bullets for local listings; locals were identified with a 2-4 character specialty channel bullet. Typically, the local channels would use the call letters but, in some cases, it would be the on-air brand. This edition was likely replaced by Northern Ontario Edition by at least 2001. This edition likely started sometime in the mid-1980s. This edition featured cable compatible listings for Sault Ste. Marie and Elliot Lake. Sault Ste. Marie listings were identified with white numeric bullets while Elliot Lake listings were identified with black numberic bullets. Non cable dial positions were identified with white bullets with a dashed border. It is unclear how long this edition ran for. Starting with the December 30, 1989 issue, the Elliot Lake listings moved over to the newly formed Sudbury-Elliot Lake Edition. This edition may have been replaced with the CANCOM edition at the same time. This is an interesting edition mainly due to the fact that the traditional TV Guide font is not used in this edition (at least as of 1989). The channel bullets have a slightly different font compared to other editions. The image on the left below shows the listings from the North Shore Edition while the image on the right is the traditional font used at the time from Western British Columbia Edtion. The difference may be a result of TV Guide purchasing a non TV Guide publication. This edition primarily served Sault Ste. Marie and surrounding communities. This edition likely started sometime in the late 1980s. This edition likely featured cable compatible listings for Sudbury. It also would have used the same font that was used for North Shore Edition. This edition was replaced by Sudbury-Elliot Lake Edition starting with the December 30, 1989 issue. This edition replaced the Sudbury edition starting with the December 30, 1989 issue. This edition featured cable compatible listings for Sudbury and Elliot Lake. Sudbury Cable listings were identified with black numeric bullets while Elliot Lake Cable listings were identified with white numeric bullets. This edition used the same font that was used in North Shore Edition. This edition was replaced by Northern Cable Edition sometime in late 1996/early 1997. This edition replaced the Sudbury-Elliot Lake edition sometime in late 1996/early 1997. This edition featured the same cable compatible listings for Sudbury (Black numeric bullets) and Elliot Lake (White numeric bullets). The cable conversion chart also provided dial positions for other northern communities such as North Bay and Timmins though Sault Ste. Marie was absent. 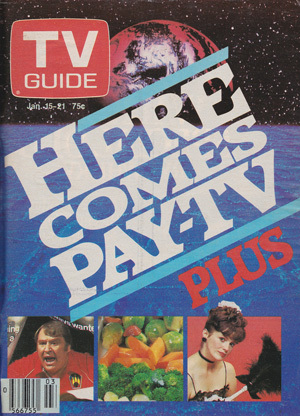 The standard TV Guide font was used for this edition. This edition was replaced by Northern Ontario Edition by at least 2001. This edition replaced CANCOM Edition and Northern Cable Edition by 2001 (possibly earlier). This edition featured cable specific listings for Sudbury and Thunder Bay. Sudbury dial positions were identified with black numeric bullets and Thunder Bay with white numerical bullets. For viewers outside these markets the standard 2-4 character channel bullets were also listed. Like the CANCOM edition of TV Guide, locals were identified with 2-4 character bullets rather than the traditional numerical bullet. This edition marks the first time that Thunder Bay was covered by TV Guide. Previously Thunder Bay was not covered by TV Guide. This edition was likely discontinued sometime in mid-2005. Published from 1977-2005. 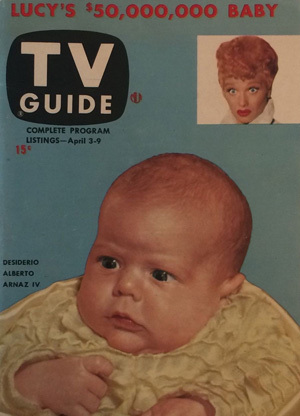 This edition was previously published by the American publication of TV Guide as early as 1965. This edition may have been renamed to West Edition in mid-2005. This edition was replaced by Eastern Canada Edition starting with the November 6, 2005 issue. Published from 1980-1981. This edition replaced the Toronto-Lake Ontario Edition for the Hamilton region. This edition was renamed Hamilton & Region edition by late 1981. Published from 1981-2002. This edition replaced the Hamilton-Niagara Edition. The Hamilton & Region Edition was replaced by Central Ontario Edition in 2002. Published from 1953-1955. This edition started with the June 26, 1953 issue of TV Guide. This marks the first time TV Guide was sold in Canada. 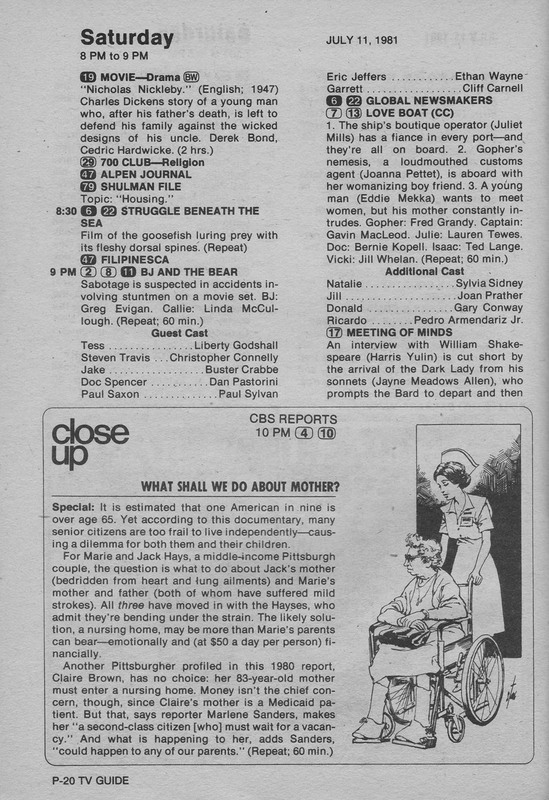 This edition included listings for Toronto's only television station; CBC plus 4 stations from New York State including WBEN in Buffalo, WHAM Rochester, WSYR Syracuse and WHEN Syracuse. Published from 1955-1965. This edition replaced the New York-Ontario edition starting in 1965. This edition served viewers in Southern Ontario and markets in Western New York including; Buffalo, Rochester and Syracuse. Published from 1965-1980. This edition replaced the Lake Ontario Edition starting with the December 4, 1965 issue. On the same date, this edition began to be sold only in Canada. This edition was split into three regional editions starting in 1980; Toronto Edition, Hamilton-Niagara Edition and Oshawa-Peterborough Edition. Published from 1980-1995. This edition replaced the Toronto-Lake Ontario Edition. This edition was merged with the Oshawa-Peterborough Edition in August 1995; Toronto-Peterborough Edition. Published from 1995-2002. This edition replaced the Toronto Edition and Oshawa-Peterborough Edition. This edition was replaced by the Central Ontario Edition in August 2002. Published from 1979-1994. This edition replaced the Montreal-St Lawrence edition for the Ottawa and Eastern Ontario region. This edition was replaced by Eastern Ontario Edition in the fall of 1994. 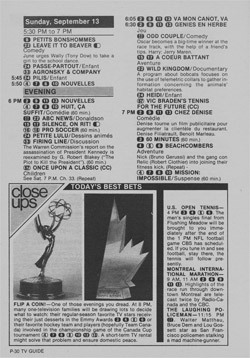 Some Eastern Ontario communites such as Hawkesbury and Cornwall were listed in the Montreal-Quebec and later Montreal Edition of TV Guide rather than this edition due to their proximity to Montreal and carraige of Burlington, VT and Plattsburgh, NY stations. Published from 1994-2005. 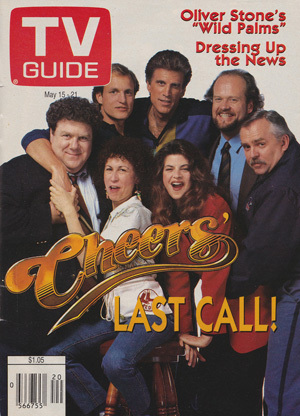 This edition replaced the Ottawa-Eastern Ontario edition of TV Guide. The markets served and locals listed initially remained the same. Starting in the late 1990s, the footprint for this edition grew larger adding in more northern communities such as Val-d'or and Rouyn-Noranda, QC. This edition was replaced by the East Edition of TV Guide (Not to be confused with Eastern Canada Edition which would eventually replace all remaining editions in late 2005). Published as early as 1955, this TV Guide edition primarely served regions of Eastern Upstate New York (Plattsburgh, Syracuse, Albany) and Burlington Vermont. This edition also featured listings for Montreal's two TV stations and Sherbrooke's TV station. The Canadian signals had their own listings section at back of the printed listings. Published as early as 1958, this TV Guide edition served regions in both Canada and the United States, mainly Plattsburgh, Burlington, Montreal and Sherbrooke. This edition was replaced by Montreal-St. Lawrence Edition starting with the December 4, 1965 issue. Published from 1977-1979. This edition was split into two editions; Ottawa-Eastern Ontario Edition and Montreal-Quebec Edition in 1979. This edition was published by the American version of TV Guide prior to 1977 since December 4, 1965. Published from 1979-1983. 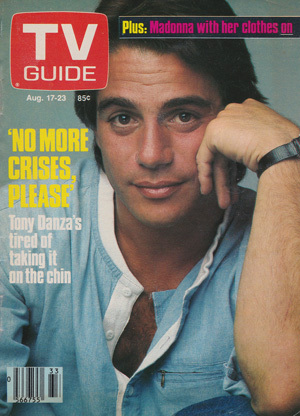 This edition was replaced by the Montreal Edition of TV Guide sometime in late 1983. Quebec City stations were listed in this edition but were dropped when the Montreal Edition replaced this Edition. The early version of this edition featured a different font style compared to other regional editions in Canada at the time. The left image below shows the style and font used in Montreal-Quebec Edition while the right shows the style and font used in other editions at the time. The traditional font was used by 1983. Published from 1983-2005. This edition replaced the Montreal-Quebec Edition of TV Guide sometime in late 1983. This edition was replaced by East Edition (Not to be confused with Eastern Canada Edition which would eventually replace all remaining editions in late 2005) in 2005. Videotron Quebec began appearing in the cable conversion charts starting in 1997 however the local stations were not listed in this Edition. This edition also served a few communities in Eastern Ontario such as Hawkesbury and Cornwall due to the fact that these communities carried the local Burlington, VT and Plattsburgh, NY stations. Published from mid-2005 to October 30, 2006. Despite the name, this edtion served Eastern Ontario and Quebec. This edition was replaced with the Eastern Canada Edition starting with November 6, 2005 issue. Montreal was considered the primary market for this edition and only the two Montreal cable systems and two satellite provider dial positions where included in the primetime charts. Like all editions printed at the time, there was a cable converter chart at the rear of the printed listings which included Rogers Ottawa as well as many other communites in Eastern Ontario and Quebec. Published from 1977-2005. This edition was replaced by the Eastern Canada edition in 2005. 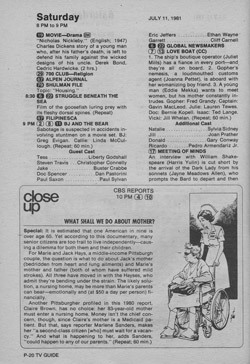 This edition was published by the American version of TV Guide prior to 1977 as early as 1976. This edition did not serve Newfoundland and Labrador.